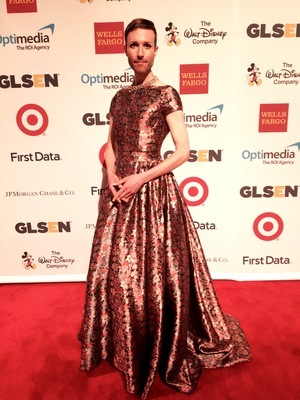 As a pundit for cable news, Jeffrey Marsh was the first openly nonbinary activist to appear on national television. Jeffrey was also the first nonbinary author with a "Big 5" publisher, Penguin Random House. Jeffrey’s best-selling self-esteem guide How To Be You, is an innovative, category-non-conforming work that combines memoir, workbook, and spiritual self-help. How To Be You topped O Magazine's Gratitude Meter and was named an Excellent Book of 2016 by TED-Ed. "...actual, living, breathing, courageous, brilliant human being." Jeffrey is one of the world's foremost commentators on nonbinary identity and activism in America, with a message of positivity and inclusion and a deep knowledge of queer issues and history. Jeffrey has reported on LGBTQ topics for TIME, Variety, Dutch National News channel RTL-TV, NewsmaxTV and the BBC. Jeffrey has also been a Cultural Consultant in Nonbinary Affairs for New York University, the office of Chirlaine McCray (New York City's First Lady), GLAAD, MTV, Condé Nast's Them and Teen Vogue. As an author, Jeffrey was the first prominent public figure to use, and advocate the use of, they/them pronouns for trans and gender non-conforming people. Jeffrey has also offered comment in The New York Times, Buzzfeed News, Reuters, Huffington Post, and Bustle and has delivered keynote talks and participated on panels at university campuses worldwide, including NYU Florence, University of Texas Arlington, and Penn State. Currently, Jeffrey is developing several TV shows centered around issues of LGBTQ identity and stories. Jeffrey maintains a robust social media following, with several hundred thousand followers and millions of views across several platforms. Jeffrey was named Viner of the Year by CBS in 2016. Jeffrey is also a precepted facilitator in the Soto Zen tradition of Buddhism. "Earth-shatteringly brilliant, [Jeffrey] will soothe your soul." "With a message of positivity and self-acceptance, red-lipsticked Jeffrey Marsh is a master of video." "Life is a journey Marsh has lived and learned, and one they hope to pass to others." "Their message is simple: Be yourself. Be happy with yourself. Be more comfortable with your differences — and embrace and enjoy them."